Formula One heads to the middle of a German forest for this weekend's race, and we're watching everything that unfolds with a beady eye. There's talk of protests regarding suspensions, a second chance for Susie Wolff, and a home race for the Mercedes team and the championship leader at the moment. Will Nico Rosberg still be leading by the time Sunday's action is over? Stay tuned to find out! The logbook will be here all weekend long to deliver quotes, tweets, links, results, facts and figures and anything else you need to know about the tenth round of the F1 season as it happens. Hello and welcome to the weekend-long Factbyte Factbox coverage of all the action from the German Grand Prix. We'll be looking at all the build up to the weekend, as well as highlighting the best bits of the action once the cars hit the track. Stay tuned! Nico Rosberg is garnering a lot of attention at the moment. The German racer is heading towards his home Grand Prix, he spent the break between races getting married, and celebrated his home nation winning the World Cup. And today, it was confirmed he's re-signed for an unspecified amount of time at Mercedes. That's a heck of a fortnight's work! Susie Wolff will get her second chance at participating in Friday practice, after her debut at Silverstone ended frustratingly after four laps. The car failed her then, but hopefully it should allow more running this weekend. Immediately after the Silverstone situation, deputy team principal Claire Williams said: "Who knows what she would have done if she had more time in the car, but we will wait and see what she can do in Germany." Not one for what ifs, our Claire. If you want to brush up on the key information for this weekend's action, I have just the post for you. Circuit info, history of the track, tyre data, weather forecasts and session timetables, it's all in one handy place. There's a lot of talk about those FRICing suspensions at the moment, with the focus of attention on whether they are legal or not, and who is going to protest them this weekend. Teams have already failed to come to a unanimous agreement which would allow the systems to continue to be run for the remainder of the season, and at least two teams have already admitted they have removed the inter-connected suspensions (presumably in advance of any protests). This would potentially allow them to protest teams who fail to remove the system for Sunday's race. It could just be me, but it seems a little bit off for a team to protest something they've also been running all season long, just because they think someone else is doing it better than them. But hey, F1 teams have been childish before, it won't be the first time! 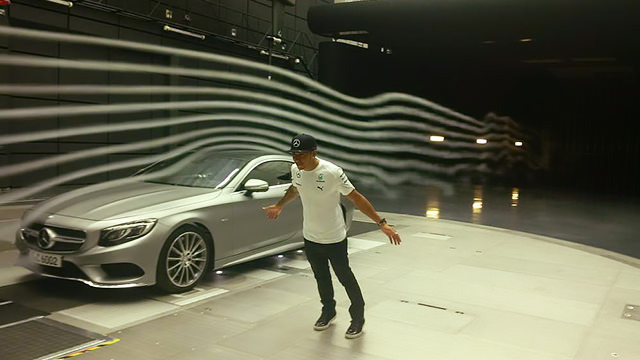 Building up to their home race, Lewis Hamilton spent some time at the Mercedes factory, including a stint in the wind tunnel. Literally. Users of the official F1 app are treated to an especially peculiar race preview video this week. Entitled 'Germany Circuit Guide' the five and a half minute clip offers little that could be characterised as a guide and consists mostly of archival footage loosely strung together in a semi-chronological fashion. The content provides no voice track, nor context for any of the action shots selected, leaving it as an exercise for the viewer to piece together what might be being shown and why. Still, what more do you expect from an app you pay for? Yesterday was a pretty awful day for many involved in the Caterham F1, with a number of staff shown the door and test driver Alexander Rossi looking for a new ride in Formula 1. Now this is a much more useful circuit guide, Silverstone winner Lewis Hamilton on what it takes to put in a fast lap around Hockenheim. Restructuring at Caterham HQ continues this morning with official confirmation of staff being let go, and positions of the key employees that remain. There are no massive surprises in the press release, but it will be intriguing to see if this new lineup can overhaul Sauber in the standing before the end of the year. Nico Rosberg has been forced to change his custom helmet design this weekend, by, of all people... Fifa. The football governing body objected to Rosberg's intention to include a painting of the World Cup trophy on the top of his helmet. Fifa complained that the design was an "unauthorised reproduction of its intellectual property in a commercial context." 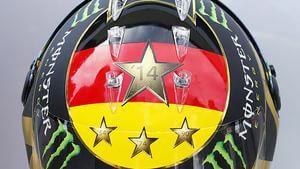 Rosberg, who is carrying the custom look to celebrate his countries success in the World Cup last week, has now redesigned his helmet to reference his national flag and a star for every World Cup Germany have won. His car number is also picked out in a rather fetching gold on each side of the helmet. Forced to comply with Fifa's wishes, Nico tweeted: "I would have loved to carry the trophy as a tribute to the guys. But of course I respect the legal situation." 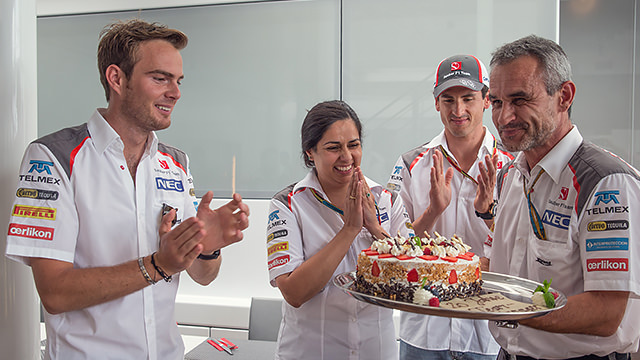 Sauber have baked some sort of concoction (CAKE WATCH) for Beat Zehnder, celebrating his 20 years of being team manager. Zehnder has been with Sauber since before they joined Formula One, initially in logistics, then as team manager alongside an engineering role. Since 1994, he has been team manager, hence the cake! Caterham's new boss Christijan Albers was officially confirmed as team principal today, and gave an interview to F1's official site. He's still hugely optimistic, but then again, he's only been doing the job less than a month. "It has only been three weeks, so far - it’s too early for headaches! No, for me it is about helping a team reach its full potential and achieve stability. If we could do that it would be a great result. The fact is that Caterham has everything it needs to have to be successful - the people, the facilities and the resources - now it needs leadership and direction and we believe that we can give the team both." Jenson Button will have a new voice in his ear from this weekend onwards, as his former race engineer Dave Robson moves on to a new role within McLaren. In his place, Tom Stallard steps up, but as lookingspiffy tweeted at the time: I'll miss Dave Robson's calm airline pilot tones. "OK Jenson, yellow G1,that's yellow G1,we'll soon be at a cruising altitude of 33000ft..."
Kimi Räikkönen was present in the press conference today, and was his usual ebullient self. When asked if he was suitably recovered from his first lap crash at Silverstone, he said: "Well, I crashed, I guess you saw it. I had some pain but it's all fine. It was in my ribs the most, that's why I didn't do the test, but it's all gone away now." The FIA have confirmed that no F1 teams intend to run front-and-rear-interconnected suspension systems this weekend. As part of his preliminary scrutineering report, technical delegate Jo Bauer noted "For information purposes, I can confirm that no car is fitted with a front to rear linked suspension system of any sort." This flies in the face of suggestions from Sauber team principal Monisha Kaltenborn to media today that her team wouldn't be making any suspension changes between the last race and this one. Of course Sauber may not have implemented such a suspension solution, or perhaps theirs differs enough not to fall foul of this mid-season shake up. As well as details about suspension, another regulation is under deep discussion at the moment. Drivers are starting to get fed up of the hefty ten place grid drops they're receiving after teams fall foul of unsafe release rules. They were asked about it in the press conference, with the three that answered all agreeing the penalty is too harsh. More to read and look at on the subject, in this rather nice F1 Big Picture. Talking of penalties, Esteban Gutiérrez has yet another grid drop hanging over his head, as the Sauber driver goes into this weekend with a three place demotion following qualifying. The sanction is in place following the incident between Gutiérrez and Lotus driver Pastor Maldonado, that saw the latter's car lifted up in the air, coming down to land with a hefty bump. Free Practice results are in, and hey, you'll never guess who is on top. Despite no one reportedly running their FRIC suspension setups, it was still Mercedes fastest for both sessions. In the morning session, we saw Susie Wolff make her second attempt at a practice run and it went slightly better - although did get off to a worrying start. "The car felt really good today and so I was able to get a good number of laps in. I was able to improve lap on lap and make use of the new set of tyres on the car. I knew today was going to be our day and so when we had issues early on I stayed calm and got the car back to the garage." The afternoon was also lively, Kamui Kobayashi attempted to wrestle the Fireman title from Heikki, after also wrestling an extinguisher from a marshal. Caterham endured a difficult day with Marcus Ericsson stopping on track and Kobayashi taking the car off track and out of harm's way. "We made a couple more mechanical changes and went back out for run two but at the end of the second lap I lost any braking power and could smell burning. I pulled over in turn 16 as the rear of the car was by then on fire and ran to grab and extinguisher so I could help to put the fire out, but that was obviously the end of the session." 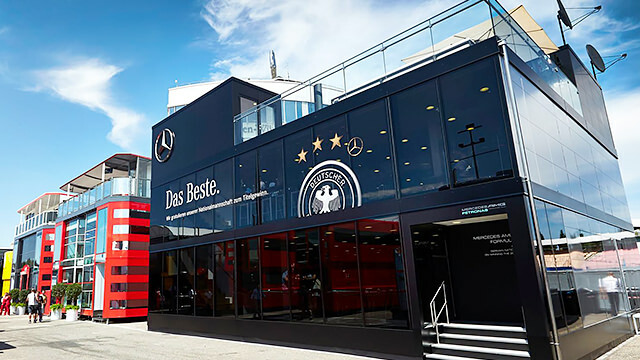 The Mercedes motorhome celebrates the German World Cup success. If you're in a hurry, here's a sixty second recap of the action from Hockenheim today, with notes on Caterham, Susie, Mercedes and that ongoing suspension talk. A spot of Ted News as we head into qualifying: "McLaren have changed their gear ratios.. The 1 change allowed all season." Nico Rosberg was the first and so far only man to drop the times down into the 1:17s, with his final practice flying lap. A very good start for his home race campaign this weekend. Williams celebrated a good qualifying result today, because although Nico Rosberg took pole position, they managed to see both drivers up in the top three. If it's like that tomorrow, that will be an incredible result. It's good news, as well, after a difficult start to the weekend: team members were evacuated from their hotel after a fire broke out. As if their F1 responsibilities weren't exhausting enough, their rest was disturbed at 3am! Full qualifying results are available to peruse but if you want a bit more detail, I heartily recommend the Factbyte Factbox coverage. Relive the drama as Hamilton crashed out, Räikkönen failed to make it into the top ten, and Kevin Magnussen subtly made his way to fourth place. Lewis Hamilton's crash was a hefty one into the barriers, but the driver was taken for precautionary checks and emerged fine, if a little bit winded. His prospects are not quite so good tomorrow, as it's looking likely he'll start from the pit lane. Toto Wolff, discussing what their options are for tomorrow, isn't sure what the ruling will be: "We have had a brake failure, which means we are obliged to make sure that the car is running safe tomorrow. What that could mean is switching the brake supplier, but if this results in starting from the pit lane is not yet discussed - we haven't yet got the decision on it." Marcus Ericsson failed to participate in qualifying after the mechanics desperately tried to patch up some hydraulic issues but missed the cut. Their hopes were raised when Hamilton brought out the red flag, granting them some extra time, but still it wasn't quite enough to get Marcus out on track. "The Stewards have received a request from Caterham F1 Team to allow car 9 to start the race despite not setting a time in qualifying. in accordance with Article 36.1 of the Formula One Sporting Regulations, the Stewards grant permission for car 9 Marcus Ericson to start the race, as the driver has set satisfactory times in practice at this event." McLaren have introduced some upgrades this weekend that look to be working out for them very nicely indeed. 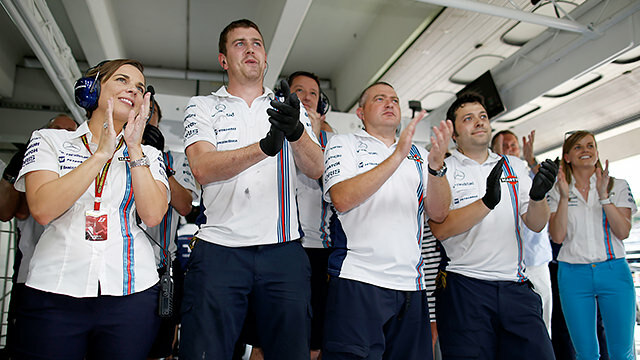 Rob Smedley, of Williams, particularly kept an eye on what they were doing during qualifying. "The midfield is very tight. If you look at what Kevin Magnussen did today it was very impressive – I was probably watching him more than I was watching our two cars in Q3! It was energizing for all the people down at McLaren. It's a big team that you have to pay a lot of respect to, that can come back at you very, very quickly." Esteban Gutiérrez faces a three place penalty this weekend, which should drop him down to 17th place, depending on Hamilton's fate of course. 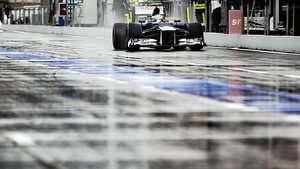 The Sauber driver put in a better qualifying performance this weekend, however, and the results don't really show that. Adrian Sutil also looked more comfortable in the car, although his fastest lap was stopped by the red flag and he didn't get to improve out of the bottom six. The team have been very cagey about whether they've had FRIC suspension on the car or not - with Monisha Kaltenborn ruffling feathers and saying they aren't taking it off (because it's not on?) and Adrian Sutil was also unable to keep a straight face when talking about it. Could it be the other teams have fallen a slight step backwards due to tweaking their suspension setups whilst Sauber have remained the same? Still not great, but comfortable in their suspension setup. Pastor Maldonado was another casualty of first qualifying, but the Venezuelan doesn't need to worry too much. He's been confirmed at Lotus for next year, with the team announcing "50% of our driver line-up." Lewis Hamilton has been confirmed as having a five place grid drop for changing the gearbox, that puts him down to 20th... unless he still opts to start from the pit lane, which seems unlikely at this point. The starting grid for the German Grand Prix, then, with two penalties and one driver given permission to start. Enjoy Sidepodcast's lap-by-lap live text highlights from today's race. Full results for the German GP are now available. Plus we have interactive charts for the driver's championship and constructor's championship. Be sure to take a look. Jean-Éric Vergne has been given a 5 second penalty for exceeding track limits during today's race. That penalty comes in addition to a stop and go received during the race. Jev also collects 1 penalty point on his super licence. The Toro Rosso driver remains 13th however, as he was more than 5 seconds ahead of 14th place Gutiérrez at the chequered flag. Having moved into third place in the constructors championship Williams appear to have their sights set on even bigger things. Claire talking post race about the prospect of challenging last years champions, "Red Bull is only sixty-seven points ahead of us - and they are in P2 - and with the current point system there is no reason why we can’t be fighting for P2 this year!" Lewis Hamilton believes a safety car should have been called to deal with Sutil's marooned Sauber this afternoon. Talking to Sky Sports following the race he complained, "There should have been a safety car. How in the world a car can be sitting in the middle of the road for several laps and the safety car doesn't come out. But... I think you know why." Presumably Hamilton was implying bias on the part of race officials, who he supposes wanted to see Nico Rosberg win the race. However when pressed what he meant by the comment, Hamilton opted not to clarify any further, quickly changing the subject. Back to back race weekends means the pressure is on to tear down the F1 garages and hospitality and ship equipment to Hungary as fast as possible. Mercedes aren't just fast in the races, they've already cleaned out their garage and headed off! 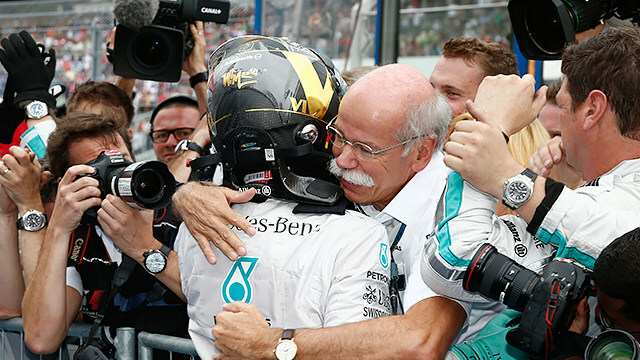 What did you make of the German GP? Cast your votes now! With the benefit of hindsight (and video replays) Button has retracted his criticism of Hamilton's mid-race pass that saw the latter suffer front wing damage. @JensonButton: After watching the race back think I overreacted with my feelings about Lewis's move. I can understand why he thought I was giving him room. Immediately after the race JB had said "I guess he thought I was going to let him past but I am out there doing my race and it would be boring if we all just let him through coming through the field." Following much criticism over the lack of a safety car following Sutil's chassis abandonment, commentator Martin Brundle noted on Twitter there is likely more going on behind the scenes than the camera is able to capture. "Dinner with Charlie Whiting. As ever, much more to track limits and safety cars than first meets the eye. Will try to get more info in future." It's a shame the FIA can't or won't be more transparent about why each decision is taken. It would make for a significantly less controversial sport. Reuters have published a report entitled "Where did all the German fans go?" detailing the severe drop in attendance for the weekend's track action. Sunday saw just 52,000 fans pass through turnstiles which represents a 38% drop on the previous race back in 2012. Circuit adviser Katja Heim noted Vettel's open criticism of the sport earlier in the year was at least partly to blame, "Sebastian in his frustration about the new Formula One and his car gave loads of interviews about how bad Formula One is now and that it's not worth going there. "As a four times world champion from Germany, people believe him more than they would the sales people. So if he says there's nothing any more for the fans, it's not Formula One like it used to be, that was 100 percent quite damaging." He may not be fighting for podium positions, but Fernando Alonso enjoyed more close racing on Sunday and he was full of praise for Red Bull's Daniel Ricciardo on Sunday afternoon. "He is driving fantastically and today he was battling very smart, always taking my slipstream after I passed him and braking very late, attacking very late and never missing a corner. "He was very, very smart, very respectful with the rules and it was a great fight." Formula 1 never stops moving forward and we've just received Sauber's Hungarian preview press release! It must be time to wind up this logbook, thanks for joining us and look out for another instalment in a few days time.